Ready to get those Valentine's Day decorations up yet? I'm ready! So here's the first idea for you! 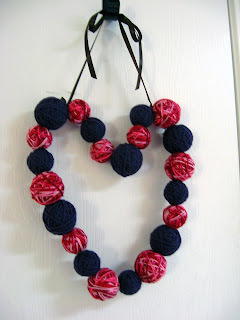 It's a wrapped yarn heart-shaped wreath. 2 skeins of coordinating yarn. 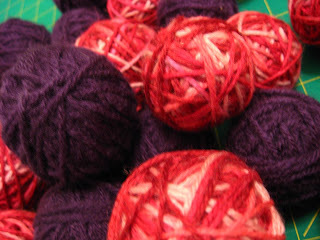 I LOVED how the variegated red/pink yarn looked when wrapped around the balls! So I would definitely do one of these, and a different solid color to coordinate. 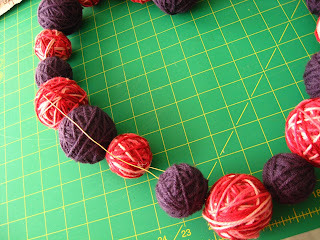 Wrap the yarn around the balls. I was worried that getting it started wrapping would be challenging, but the yarn kind of held onto the styrofoam texture and I didn't need any additional adhesive to keep it on. 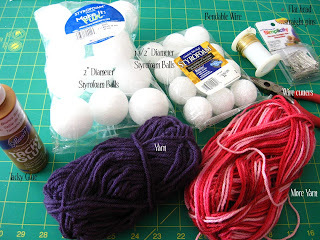 Now randomly wrap the yarn all around the ball until you can't see the styrafoam anymore. 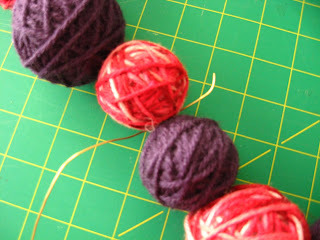 When you're done wrapping, trim the yarn and put a small dot of tacky glue on the end. I used the straight pin to hold it in place while it was drying. (I had intended to remove the pins when the glue was dry, but the heads were really tiny, so I just left them stuck inside. You can't see them.) You'll have a pile of these when you're done. I did half of each bag a different color. 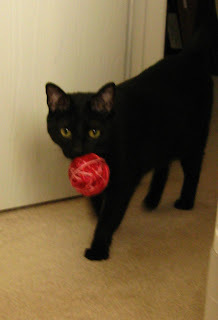 If you let one get away, they apparently make great cat toys! I had to reclaim one of my pink ones! Now, layout how you'd like them to look like when you're finished. Then cut a 4 1/2' length of wire. 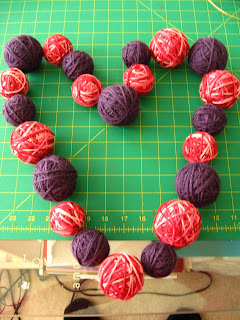 String the yarn balls onto the wire and shape it into the heart shape. When you get the ends back together, just wrap the wires around each other. (Close up of wires.) Then trim. 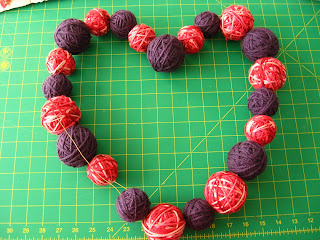 Tie the coordinating ribbon onto the top of the heart, directly onto the wire. Hang you're finished wreath! How easy was that? Wrapping the balls is what took the longest, but I did it while I was watching a movie. Once you get the hang of it you can pretty much do it without looking. Shaping the wreath took no time at all! Let me know if you made one, I'd love to see it! That is fantastic! I love the yarn! I'll be linking in my Valentine's Day Roundup. So darling!! I'll be making one of these tonight with my kids. This is so cute because I'm a sentimental woman I want that my boyfriend gift me something like that but the problem is he's a little bit cold. Very cute! I'm bookmarking this one. ♥ I found you through One Pretty Thing.